Vote-by-Phone™ is a hybrid voice- and web-based application designed to automate proxy ballot management for organizations handling investor communications or related shareholder services. Vote-by-Phone uses a powerful ballot engine that enables new ballots to be configured without programming using a simple and flexible user interface. Once configured, proxy ballots can be delivered through a voice-driven voting application, a web-based voting application, or through traditional print formats using PDF output. Vote-by-Phone™ uses XML-based templates that enable even complex proxy ballots to be configured in minutes without changing a single line of code-and and without limits to the number of nominees or the number of proposals that can be contained in a single ballot. The Vote-By-Phone™ application makes it possible to switch between DTMF/touchtone- or voice-based operation as needed on-the-fly. Ballots can be defined to make use of professionally recorded voice prompts, text-to-speech (TTS) or any combination as requirements dictate. Once a ballot has been added to the system it can be immediately used to process votes by the voting application. Specific ballot templates can also be linked to specific 800 numbers or DIDs enabling multiple voting campaigns to be run concurrently. Flexibility is provided at every level to make processing votes as simple and reliable as possible. The Vote-by-Phone™ application makes voting fast and easy. Users are prompted to identify themselves using either a control number or combination of user defined information such as SSN or Caller ID. Once identified, users are quickly guided through ballot questions using a simple and intuitive user interface. Depending on how the ballot template was designed, the user may be using voice commands such as "Yes", "No", "For", "Against", "Abstain", or using the touchtone/DTMF key responses to indicate their votes. A secure confirmation step completes the voting process and logs the votes providing the caller with a unique confirmation number that can be tagged with the call for future auditing purposes. User-level security is enforced to limit access to the system and the application can be configured to prevent callers from voting more than once. Full audit logs are maintained of all voting activity and security events. A complete set of application reports are provided so that you always know the status of voting campaigns that are being processed. Vote-by-Phone™ has been designed primarily as a full-featured voice application. However, the same template engine used to dynamically drive the voice voting application can also be used to control web-based voting and print-based PDF output. 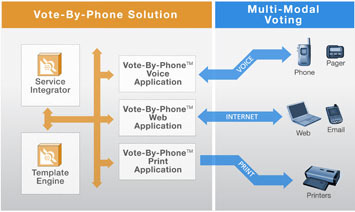 Vote-by-Phone™ comes bundled with web and print functionality for no extra charge. A fully functional web-based voting application is included that runs from the same ballot definitions used by the voice application. An additional web template is used to control the look and feel of the web pages and a separate web-server is required to host the application. All back-end functionality, security, and logging are done using the same components as the voice application. Print output capabilities are provided through a PDF generator that combines a page template with a ballot to produce PDF files. The generated output file can be used to create high-quality printed output from any ballot created in the Vote-by-Phone system.